Lee was going to be appearing at a screening of "Desert Cathedral" as part of the Lower East Side Film Festival, and I knew I was going no matter what. It had been almost two years since I saw the man and I was not going to miss the opportunity. I contacted all the peeps to see if anyone could go. Alas, no one else was able to make it on such short notice. I decided to go anyway. 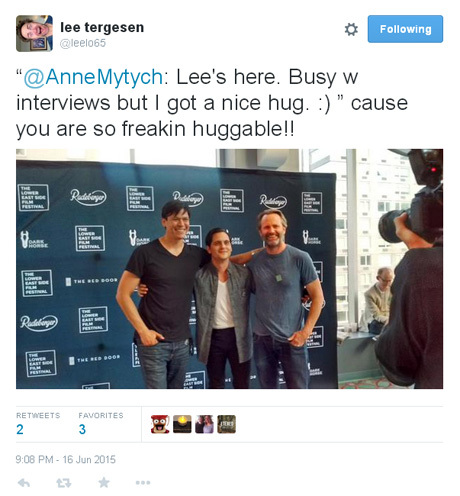 On June 14, I got to the theater around 6:15pm, and Lee arrived a few minutes later. He was being interviewed and taking pictures so I didn't make eye contact with him right away. We finally said hello, he gave me a hug, and then he had to go off and do some more chit chat. I overheard him tell someone that he wasn't expecting to have his photo taken. He had on jeans and T-shirt. He looked pretty good to me. A few minutes later, he came over to me again and brought me over to meet his cousin and his wife and some friends. Like me, the cousin also traveled from Maryland, but from the Eastern Shore area. About 7:40pm, people started heading into the theater. I sat behind Lee, who sat next to a friend and his cousin & wife. I could see him the whole time I was watching the movie, which was different than when I watched "Silver Tongues" with him in 2011. It felt more like I was watching the movie with him. Seems silly, but that's how it felt. Just before it started, Lee was talking with his buddy and his cousin and turned so I was included in the conversation. He's so thoughtful that way. The movie itself was well done, if depressing. [SPOILER ALERT] "Desert Cathedral" is the true story of a man who disappeared on his family in 1992 after he encountered severe financial difficulties. He wandered around near the desert videotaping his adventures until he could get up the courage to commit suicide so his family could get the life insurance money to get out of debt. He was very tortured, and Lee excels in that type of role. He really made you feel for the guy. Chaske Spencer played the private eye hired to find the missing man, and he had amazing chemistry with Lee. Oh, one note: When the movie started, it was with a voice-over from an actual recording made by the man who disappeared. I knew immediately it wasn't Lee's voice, although I expected it was going to be his. During the credits, when Lee’s name came up on the screen, someone behind me yelled out, “Yeah!” and started clapping really loudly and whistling. A man after my own heart. I followed suit and yelled out some “woots, but I can’t whistle. When the movie was over, the film festival crew did a Q&A with Lee, the director (Travis Gutierrez Senger) and Chaske. One person asked Travis how the film came out and what kind of relationship he developed with the man’s family. Another one asked about the chemistry between Lee and Chaske. Turns out Lee and Chaske lived together during the filming and became close friends, which was reflected on the screen. Lee told a story of how -- a couple of years after filming ended -- he had come from Japan do some additional work on the film. He flew 14 hours from Japan, then five hours to Seattle and then stayed up all night filming. And at one point, the director said, “I need you to make it lighter.” Lee told this story very well showing his exasperation with Travis in his gestures and tone. Lee said he replied, “You can have me like this or asleep.” Or something to that effect. The audience got a kick out it. 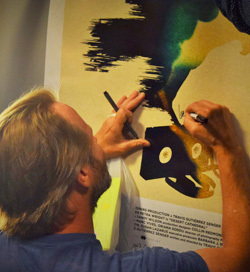 The associate producer for the film, Sabrina Coulston (who is also the real-life daughter of the man depicted in the film), got the poster out of the display and asked Lee to sign it. He had trouble with the pen and Sabrina asked Travis to find a Sharpie. Lee sarcastically remarked that it was going to look like he didn’t know how to sign his own name. After the Sharpie arrived, Lee signed it again – more clearly this time – and then Travis signed. It was around this time that I met Travis and Sabrina. Both very nice people. I could not get over how young Travis was -- 32 years old. Somewhere around this time, I asked Lee’s cousin’s wife to take pictures of Lee and me. When I went to take my camera out of my purse, I dropped my wallet on the floor and tons of change came flying out. Lee dove for it like a kid at a broken piñata, scooping it up like he was going to keep it. Then I told the cousins about the Kumpe story and the four quarters (from 2002), which I think Lee had forgotten about it. He laughed like he was hearing it for the first time. Lee was teasing the woman while she was taking the pics. “Did you cut our heads off?” That’s why I was laughing in some of the pics. Also, I was really, really happy. When we went downstairs, we saw it was raining. Lee lamented that he hadn’t checked the weather because he rode his bike. He suggested we go get something to eat and maybe it would stop. But then he did check the weather and it was supposed to rain all evening. Then one of the film festival people offered him a T-shirt but it was medium and he needed a large, so she went scouting the van for a large. It seemed to take a while and he joked that maybe they could carry his bike home for him. She said of course, but he said he was only joking. We walked over to a restaurant called Smiths to have dinner and visited. It was diagonally across the street from the theater so we didn’t get too wet. We talked about kids and my boys and his daughter. He told me a cute story about Lily interacting with another child at the playground. He is such a CUTE dad! We also talked about some of the other peeps who couldn’t make it. 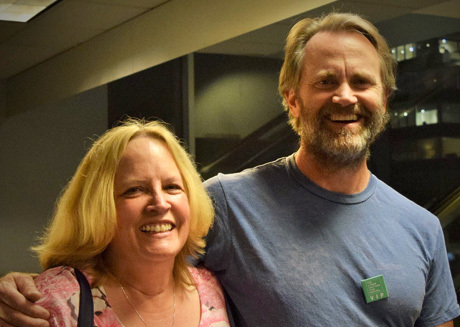 We talked about Merrily and how she really tried to get here. We talked about Erin and I said she really wanted to come but she didn’t have vacation time. He laughed and remarked that vacation was her only obstacle? Not flying in a plane from Australia?! Then we talked about Leslie. I said I wasn’t sure why she couldn’t make it, and he replied (with a completely serious face), “She’s pissed at me. She’s not speaking to me.” I said, “I know you’re joking.” And he just smiled. Then he told me his dad had died in April and that he had dementia and some other health issues. He had been living with Chris (Lee's brother), but they were getting ready to move him into an assisted care facility. He died before the arrangements were finalized. I told him about some of the issues I’ve been having with my youngest – Lucas – and he talked about he was the wild child in his family and he used to fight with him Mom when he was a teen. As we were talking, the "Oz" episode popped into my head and I blurted out, 'Cuts like a Knife.' That’s the name of it.” He said, “Anne, that’s what you said before.” I said, “I did?” Clearly, I am losing my marbles. Then I rambled on about how fans referred to it as CLaK and that should have helped me remember. Then he asked if that was the one where Chris leaves. And I got very animated here and told him that it was the episode where he knocked Kevin Kline off my favorite actor pedestal. I am pretty sure I told him this story before, but he didn’t stop me. LOL. I told him about how impressed I was by how he conveyed all the emotions Beecher felt without saying a word. He just smiled and listened. He’s so damn cute. Oh then he got snarky and said Kevin Kline should have been knocked off the pedestal just for who he married (Phoebe Cates). And I was confused. Why? He said because she was in that stupid teen movie, and I just laughed. Then he asked if they were still married. I said yes and they had two kids. Then Lee remarked, “So he’s not completely off the pedestal, is he?” I guess because I still keep track of Kevin? I certainly didn’t stop admiring him. I then told him I finally met Kevin for the first time in 2011. I also asked about which villain was more fun to play – Rahm Tak on "Defiance" or Philomen Keating on "Copper" - because they were both villains with big personalities. He agreed that they were both fun to play but that he liked "Defiance" because he had more episodes. He said the "Copper" episodes were probably a bit better written, but just he didn’t get to stay as long. He also mentioned one of the writers on "Defiance" also worked on "Weird Science." Graham Greene had a part in "Desert Cathedral," and I could have sworn he worked with Lee before, so I asked him. He said Graham was on "Longmire," but they didn’t have any scenes together. I was actually thinking of the TV movie he made called "A Thief of Time," but I couldn’t remember the title so I let it go and then looked it up later at the hotel and tweeted him. I also told him about my plan for a dream vacation this summer: to go out to Austin, Texas, to see the bats fly and then go to Mission, Texas, to see the National Butterfly Center. It was very relaxing and fun just to hang out and chat with Lee about anything and everything. Really felt like I was just hanging out with an old friend -- and I guess after 13 years and 15 meetings, that is what we have become. I just love that. After dinner, we went outside to see it was still drizzling. It was, but not too badly. 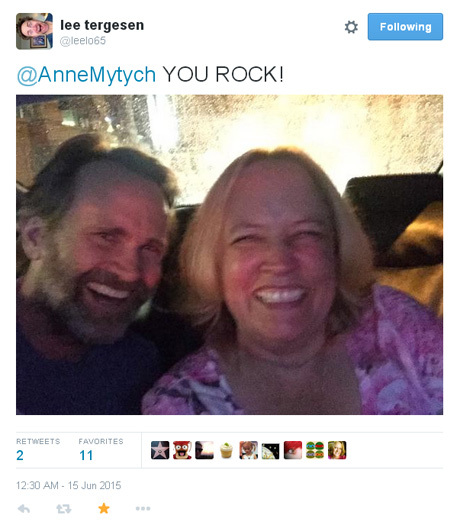 He was miraculously able to get a cab. I told him about how earlier in the day I had caught a gypsy cab and I was pretty sure I got ripped off. Then he took out his phone and said we have to do a selfie. I think he took several, then scrolled through to find the best one, which he later tweeted. When we got to the corner of Seventh and 30th, there was some confusion about which way the cab was supposed to go, so we decided just get out and walk. It was still drizzling but slowly. Unfortunately, I led him in the wrong direction. We had gotten about three-quarters of the way down the block when I realized. I said I could make it back alone and he didn’t need to go with me since it was out of his way. He insisted saying he didn’t want me to get mugged. Such a gentleman. When we finally got to the hotel, we said goodnight and hugged. I thanked him for the ticket, the cab ride and the dinner. He teased me, “Dinner is third?” I said I knew it was three things, they just came out in that order. Then I said I had to give him two more hugs and kisses – one from Merrily and one from Erin. Poor me – my work is never done! It was a lovely evening, but I didn’t’ get to sleep until almost 2:00am and had to get up at 7:00am to catch an 8:30am bus. But it was worth it.